The Tuscan wineries I visit on my tours are family estates, some of medium size, while others are very small indeed. I often get asked how I choose them…the answer is simple. I choose wineries where the quality of the wines, and the quality of the welcome go hand in hand. Each aspect is equally important, and not all wineries have a combination of the two. I’ve visited many estates over the years, and I’ve narrowed it down to a small handful who satisfy my requirements to the full. I’m not concerned with how famous they are, in fact I avoid the big names. Visits last from one to one and half hours, and we take in two estates. We also take a leisurely drive through the iconic Tuscan scenery and I’ll give you ample time for photos. 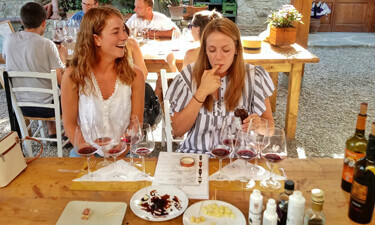 I assure you of a representative experience of both Chianti and Super Tuscan wines. Brogioni is one of the smallest Tuscan wineries in the Chianti region, and everything you’d expect of a family estate. 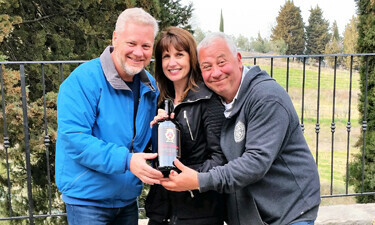 It’s run by Maurizio and his wife Cristina, and the family have been producing wine for generations, and the current property of 10 acres was acquired by Maurizio’s father in the 1950’s. At that time farming was pretty much 360 degrees and they sold vegetables, pigs, chickens, olive oil and wine. Then things changed during the seventies, and traditional all round farming was replaced everywhere in the Chianti region with “just” olive oil and wine. Maurizio took on the business from his father in 1990. Today he produces only 12000 bottles a year between Chianti, Chianti Reserve, and a Super Tuscan based on Merlot and Syrah. He only uses estate grown (organic) grapes and though he could buy grapes to increase his very limited production, he doesn’t trust other growers and prefers to produce less, but produce well. His motto is “to make good wine your need good grapes.” As an added bonus, the olive oil from his centuries old orchard is something to write home about too. Your visit here will be totally private, and you’ll have the pleasure of meeting Maurizio in person who always finds a way of charming my guests with his disarming personality. Many Tuscan wineries take their name from ancient castles, and this is the case of Monterinaldi. The castle stood perched on the nearby hill till 1268 when it was destroyed by the Sienese. It subsequently became a tiny but lovely hamlet. 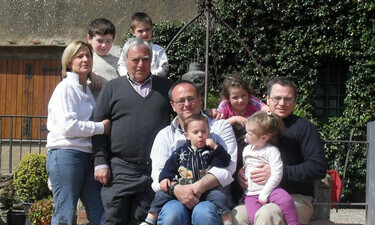 The farming activities located below the hill at Pesanella has always been part of the property, and was acquired by the Ciampi family in 1961, and it’s now run by Daniele Ciampi who is second generation. 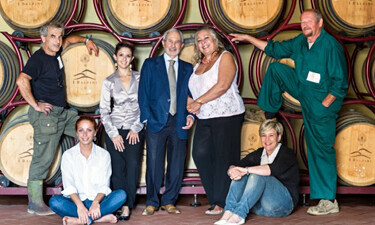 As all of my wineries, it’s a family estate albeit one the larger and more influential. Monterinaldi has eighteen single Vineyards spread over 136,000 acres. The grapes grown are Sangiovese, Petit Verdot, Syrah, Gamay, Merlot, Cabernet-Sauvignon, Cabernet-Franc, and other native Tuscan varietals. After a four year experimental period, organic management has been extended to the entire property and is certified as of the 2017 vintage. The whole wine making process takes place on the estate, using only estate grown grapes. The Tradition of Tuscan wine making methods is a fundamental principle at Monterinaldi, and their primary goal is to offer Chianti Classico in its most traditional form, however taking advantage of all the recent technology possible. Their other claim to fame is a superb Super Tuscan. 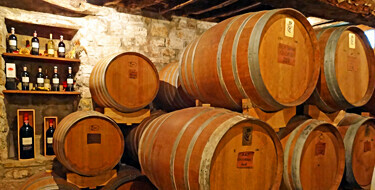 The ancient underground cellars make the perfect environment for aging wine. Here their Chianti Classico is first kept in barrels (french oak tonneaux and barriques) and then refined in bottles, for periods ranging from 6 months to 2 years. 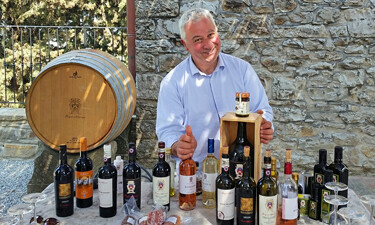 Last but certainly not least they have one of the happiest staff in the whole region which is why Monterinaldi is a favorite stop of my Wine Lover’s Tour. They are always eager to make your visit a memorable one; and all my guests over the years have confirmed this last statement. Of all my favorite Tuscan wineries, La Sala has one of the longest traceable histories going back to 1260. It’s belonged to various noble Florentine families during the centuries, but here we’ll talk about more recent events. 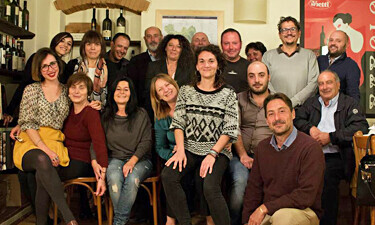 The basis of what the estate is today was established by Laura Baronti who owned it from 1981 to 2014. Together with her oenologist (wine maker) Gabriella Tani, she built a solid reputation for the excellence of their Chainti Classico wines. Particular prestige has always been associated with their supertuscan ” Campo all’Albero” which is a 50/50 blend of Cabernet & Merlot. It’s still produced today, and it’s as good as ever without the exaggerated prices of some of the more famous supertuscans. Franceso Rossi Ferrini who was already the owner of another the prestigious estate called il Torriano, acquired La Sala in 2014. He immediately implemented a modernization program both in the vineyards and the cellars. The estate is now fully organic with sustainable farming which respects bio diversity. The estate has vineyards with altitudes that vary between 500 & 1150 feet, and varying exposition to the sun. This means varying grades of ripeness, and the possibility of harvesting depending on requirements for a given season. The estate covers a total of 173 acres, of which only 79 are dedicated to vineyards. By the way. All Chianti and supertuscan wines are dependent and made by the weather. There’s no irrigation in the field, and “manufacturing” practices in the cellar which may be common in many parts of the world, are limited and even illegal. Of course modern wine making processes have reached a fine degree of perfection, and it’s possible to make an acceptable product even in the not so good seasons. If it’s a very bad season Chianti and supertuscans are not made, but fortunately this happens rarely and the last ten years have given good to outstanding wines. The point is; they are different every year, as opposed to always being the same no matter what the weather. I suggest you be wary of what you’re drinking with standardized wines. From the middle ages, farming on Tuscan wineries was done by share croppers who always got a very bad deal from the land owners. For this reason the system was made illegal in the 1960’s. This period also coincided with Italy’s economic and industrial boom, so farmers where leaving the countryside to get jobs in factories. This left the farms unattended. For these reasons the land owners got rid of their properties and would do so at very low prices. Though they were quite poor, the advantageous prices meant some of the estates were acquired by the farmers themselves. The result is that today they are run by their sons and grandchildren. This is the case of Castellinuzza and Piuca. 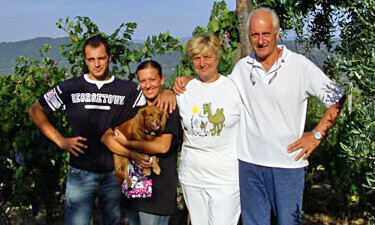 The tiny family winery is run by Simone and Francesco , who’s father originally bought the property in 1961. With pride and passion they produce wine “as the weather permits.” This means a lot of tradition with just a hint of modern technology. They insist on saying “our wines are made with sunshine and rain,” and consequently will be different every year. Unlike the big corporations who produce standardized wines time after time, no matter what. One should ask how do they do that…is it all grape juice? 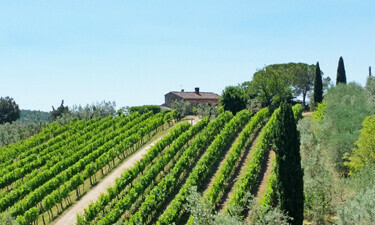 As often happens with the smaller Tuscan wineries, the vineyards at Castellinuzza are cut out of the hills on Terraces. This makes viticulture very difficult, but the scenery for visitors is a true feast for the eyes. I often visit this winery at midday for a genuine home cooked lunch. The meals are prepared by the ladies of the house and of course we’ll be tasting their excellent Chianti wines and genuine olive oil. Altiero is one of those Tuscan wineries that represent a new generation returning to the land, that was once of their grandparents. This tiny family estate is run by Paolo and his wife Samuela, with a little help from Paolo’s parents whose duties also include babysitting. Paolo inherited the property that had been left unattended for some time, but he decided it would be his life. In fact the name of the estate “Altiero” is the first name of Paolo’s grandfather. He graduated in Agriculture in the year 2000, and by 2001 he was the youngest wine maker in Europe. His first products were “garage wines” in the sense that his cellar was his garage. Seeing his son’s passion, Paolo’s father Maurizio decided he would quit his lumber business and became a very important helping hand. 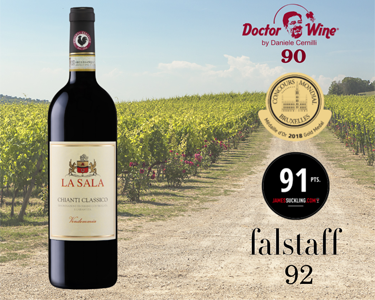 They’ve come a long way since the garage days, and now have modern high tech cellars where they produce outstanding Chianti, Chianti Classico, a Super Tuscan and a Rosè. The emphasis is on traditional Tuscan wines, which means fruit and a bright acidity which lends them to be consumed with hearty food. In fact this is one of the wineries of my Tuscan Family Winery and Home Cooked Lunch Tour where you will find out just how good Chianti can be with the right food. The meals are prepared by Samuela, who though not a chef never ceases to amaze my guests with her cooking. Many state it’s the best meal of their holiday, and you can believe them. Last but not least they produce some of the best olive oil you can find. I Balzini is one of the more recent Tuscan wineries (at least for Chianti) and was founded by Vincenzo D’Isanto in 1980. His desire was to produce something different in a region where everyone produces Chianti. Chianti is a great wine, but due to the appellation rules it’s not open to much interpretation. Vincenzo carefully researched the terrains of the available properties, because his idea was to produce Super Tuscans from the outset. He found what he was looking for in a terraced property near Barberino Valdelsa callled I Balzini. The name I Balzini in Tuscan vernacular means the terraces. He planted the traditional grapes for the Super Tuscan blend, namely Sangiovese, Cabernet Sauvignon and Merlot and patiently tended his babies for a number of years. His first wine “I Balzini White Label” was produced with the 1987 harvest. It’s a Cabernet Sauvignon, Sangiovese blend made under the guidance of the grand master somellier Giulio Gambelli. The second wine “I Balzini Black Label ” was born some eleven years later in 1998. The blend this time was Cabernet Sauvignon and Merlot. Since then another four wines have been added and they all pertain to the Super Tuscan category. Another consistent attribute is the never ending run of international awards. However don’t let the award winning aspect frighten you. The great thing about these wines are the prices. While not cheap…great products rarely are, they’re certainly more affordable than the big names in Super Tuscans like Antinori and Sassicaia. It’s my opinion you can often pay more for the name than the liquid in the bottle. The wines of I Balzini easily rival any of Tuscany’s big name products, while being a touch more affordable. 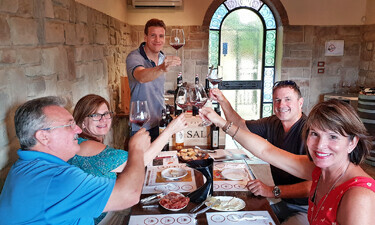 For more on my Super Tuscan tour see here.